Do you love STING? 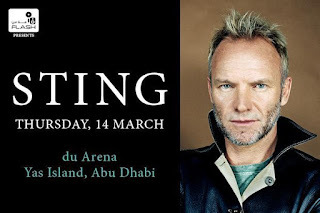 Win a ticket to his upcoming gig in Yas Island, Abu Dhabi on 14th March, 2013 with Mashreq Bank. Answer a simple question and invite your friends and family to click LIKE to your answer. Two winners will be announced, basis on the most LIKES & of course correct answer. Deadline is Thursday at 3pm. So why are you waiting answer to the question here. Dear friends please support me by hitting LIKE on my comment. You must make sure to include their targeted keywords too. One of the best ways to promote your business is through internet video marketing. Ahaa, its good discussion concerning this paragraph here at this website, I have read all that, so now me also commenting here.